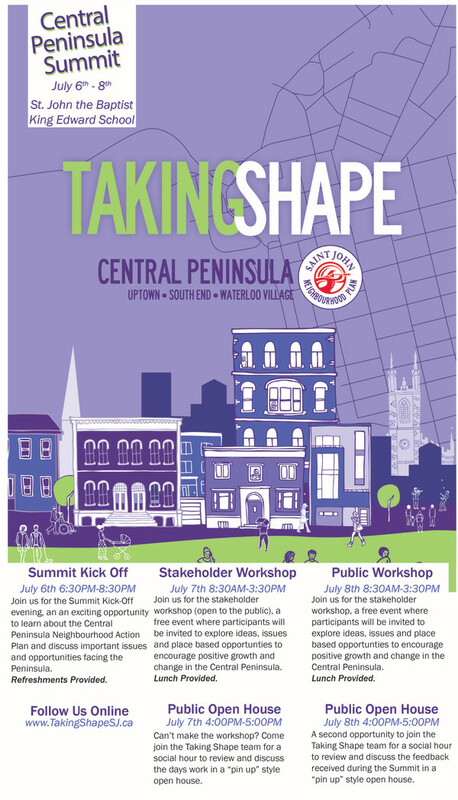 Please join us for the Central Peninsula Summit from July 6th to July 8th and be a part of what’s taking shape on the central peninsula. The City and Urban Strategies Inc. is hosting a free three-day conversation at St. John the Baptist School that will bring residents, stakeholders and community leaders together to explore the opportunities and challenges facing the Central Peninsula, and to discuss ideas and directions for the future, including how to improve and enhance the Central Peninsula’s many unique places. The Summit is structured around a series of thematic discussions. Participants will be presented background information, and then invited to explore ideas and key place-making opportunities within each theme to bring about positive change and better position the Central Peninsula as a valued place where people want to live, work, recreate, and raise a family. The ideas that emerge from the Summit will shape the Central Peninsula Neighbourhood Action Plan, which will demonstrate how strategic public sector improvements and private sector developments can bring about positive transformation over the next 25 years.